The Early Intervention Section is advised by the Hawaii Early Intervention Coordinating Council (HEICC). 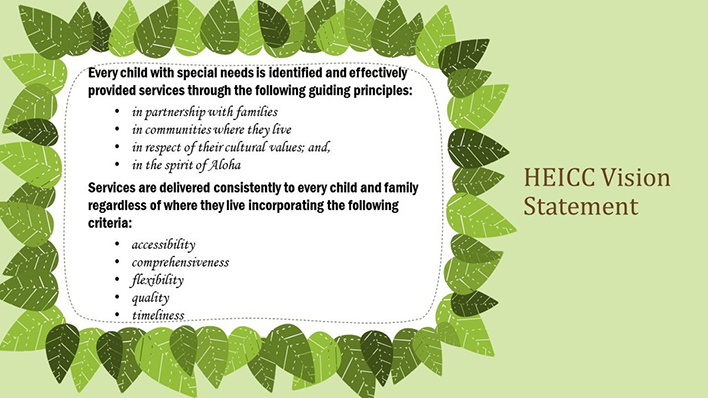 The HEICC is established as required by state law (Hawaii Revised Statues §321-353) and Part C of the Individuals with Disabilities Education Act (IDEA). HEICC Orientation: This powerpoint presentation is an orientation for new HEICC members. It provides information about Part C of IDEA and Hawaii Early Intervention services. HEICC Quarterly Meetings are open to the public. Meeting notices are available on the State of Hawaii, Calendar of Events – under Department of Health, Hawaii Early Intervention Coordinating Council. For further information, please contact Charlene Robles, EIS Supervisor, or Aya Aoki, HEICC Coordinator.